« Summer Stage 2017 – Live Music Outdoors! 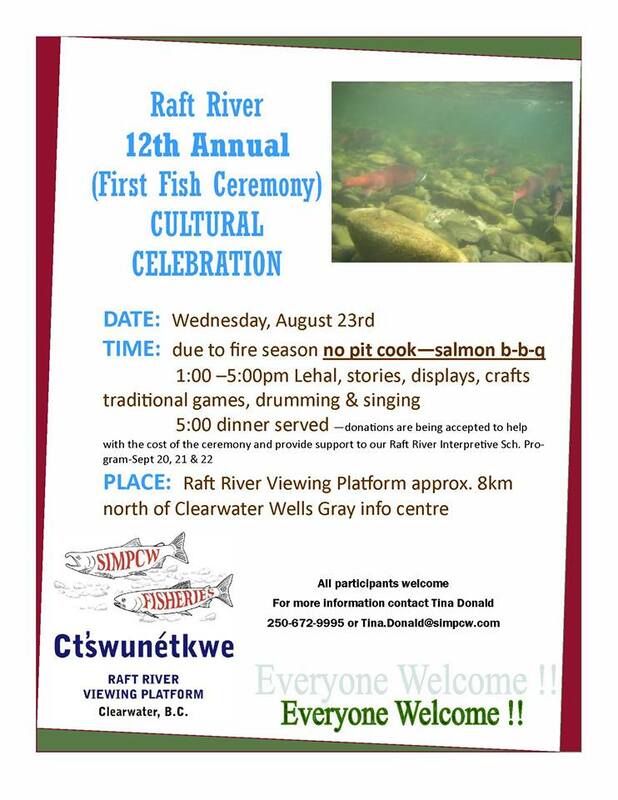 The ‘First Fish’ ceremony takes place this year on Wednesday August 23rd at the Raft River Viewing Platform, located 8km on Highway 5 North from the Wells Gray Park Information Centre. The event will include traditional drumming, singing, and games, as well as stories and crafts. It runs from 1-5PM. At 5PM, a salmon BBQ dinner will be served, available by donation. The first fish ceremony is a cultural celebration of the return of the Salmon upstream from the Pacific Ocean. By the time they reach the salmon viewing platform, the fish have traveled approximately 550Km, a remarkable feat.